Vishal is being appreciated for his performance in Thupparivaalan and the film has been receiving positive note overall. Thupparivaalan starring Vishal, Prasanna, Vinay Rai, Andrea Jeremaiah and Anu Emmanuel hit the screens today and has been receiving positive reviews. Directed by Mysskin, Thupparivaalan will have Vishal playing the role of a detective, a role which he hasn’t tried his hands at before. Thupparivaalan also features actor Vinay Rai as the antagonist who is appearing in a film after a gap. Vishal, speaking to a leading daily, spoke about what convinced him to produce Thupparivaalan and Mysskin’s vison about films. “I have seen Mysskin work on storyboards. It’s a rare quality in filmmakers. He’s a man of great vision. He plans and jots down everything,” Vishal was quoted in New Indian Express. “Doing Thupparivalan was also a relief because I produced it. Another producer may not have done justice to such a film. For instance, we shot the climax portions for about 26 days in Pichavaram. I understood what the film really needed and spent money accordingly. I didn’t compromise on the production values. 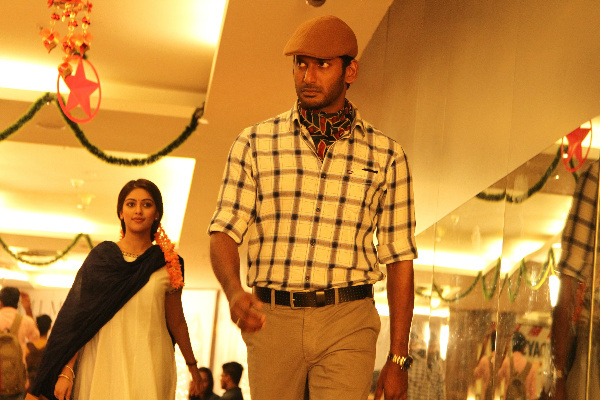 I think I’ve chosen Thupparivalan at the right time of my career,” Vishal added further.